Me in foils, originally uploaded by cynthiacloskey. This evening I had my hair colored and cut. 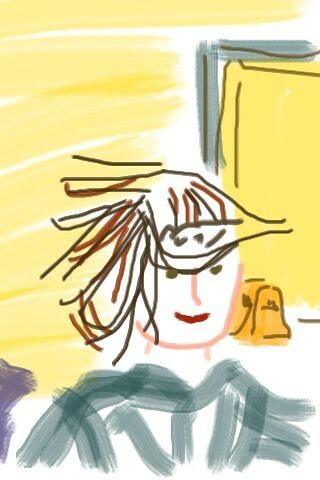 I thought of taking a photo of myself all done up in foils as I was getting my hair highlighted. Almost immediately I thought better of it. Instead I made this sketch. My stylist said it looks like me — but then, she always compliments me. Most accurate bits: shape of foils, sketch of someone else’s purse in the background. Hardest bits to do: chin and nose. Photo of results of color and cut: to come tomorrow or the next day, when I have time and better light. But I can tell you in the meantime that I am very pleased indeed. Your self portrait has touched my heart with its fragile lines and gentle colors, Cindy. Impressive! Please don’t lose the talent you have honed, the way I did. Keep practicing! I think this pic would make a great book cover. And you have a great title, too: “Tin Hat”. This is a wonderful drawing. And I’m not just saying that because I got MY hair cut and colored tonight. T-Rex and Drama Girl were there, too, and said I looked like George Washington with my hair in foils…definitely not as cute as in your rendition!